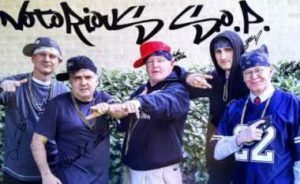 FORT WORTH, Texas — Southwestern Baptist Theological Seminary (SWBTS) has issued a public apology over a photo featuring five seminary staffers posing as gangster rappers after the image stirred controversy on social media. The men in the photo, all being from the seminary’s School of Preaching, had posed as a parting gift for Assistant Professor Vern Charette, who was known at SWBTS for his rap stylings. Charette was leaving his post to take a pastoral position. Posing for the picture memorializing Charette were David Allen, dean of the School of Preaching; Kyle Walker, the seminary’s vice president for Student Services and a professor of preaching; Barry McCarty, a preaching professor and chief parliamentarian for the Southern Baptist Convention; Deron Biles, a dean emeritus and a professor of pastoral ministries and preaching; and Matthew McKellar, an associate professor of preaching. The seminary professors wore bandanas, hoodies, gold chains and sideways ballcaps—and one even sported a handgun. Above their heads, in graffiti fashion, read the words “Notorious S.O.P. (School of Preaching),” which was noted by the seminary as being a parody of the secular rapper Notorious B.I.G. Allen shared the photo on Twitter, writing, “Why you should come study at the School of Preaching @swbts! Rap the word. Reach the world.” Charette also wrote about the picture that the men were “all true OG’s” meaning “original gangsters.” McCarty shared the image as well. However, some became offended by the photo, stating that the professors’ apparel appeared to mock black rappers. “This is blatantly racist. Ya’ll should be ashamed of yourselves, especially considering your denomination’s history,” one commenter wrote. “Grown adult men gathering together to take a picture and holding a gun no less. Stereotyping and being racist. It’s disgusting,” another opined. Due to the controversy, the seminary asked that the photo be removed from social media. President Paige Patterson also released a lengthy explanation and apology over the matter. “The president encourages our people to laugh at each other rather than to risk taking ourselves too seriously. But, as all members of the preaching faculty have acknowledged, this was a mistake, and one for which we deeply apologize,” Patterson said.